The science underpinning species triage does not say saving the most threatened species is pointless. Species triage says we should spend resources in a way that saves the most species. Determine how many more species could be saved with increases in the budget. Species triage recognises that conservation requires choices. If we have some money available that could be spent on, for example, two species, triage answers the question of how best to spend that money on each. Triage also helps answer questions regarding other choices. For example, should we aim to prevent the extinction of all Australia’s bird species at the cost of approximately $10 million per year, or use that money for another four hours of defence spending? Which of those options would more efficiently protect Australia’s heritage? $10 million per year is predicted to save all of Australia’s bird species from extinction over 80 years. $10 million is equivalent to 4 hours of defence spending in Australia, or approximately the cost of maintaining one fighter bomber for half a year. Species triage is similar, but requires us to consider trade-offs in allocation of effort among species rather than between species and aircraft. The efficiency of management for each species. For example, with a given effort, what is the expected reduction in extinction risk for each species, taking into account the chance of success? The specific objective. For example, are we trying to minimize the number of extinct species or the number of threatened species? The relative value we place on species. Would we mourn the loss of some species more than others, or do we consider all species equal? 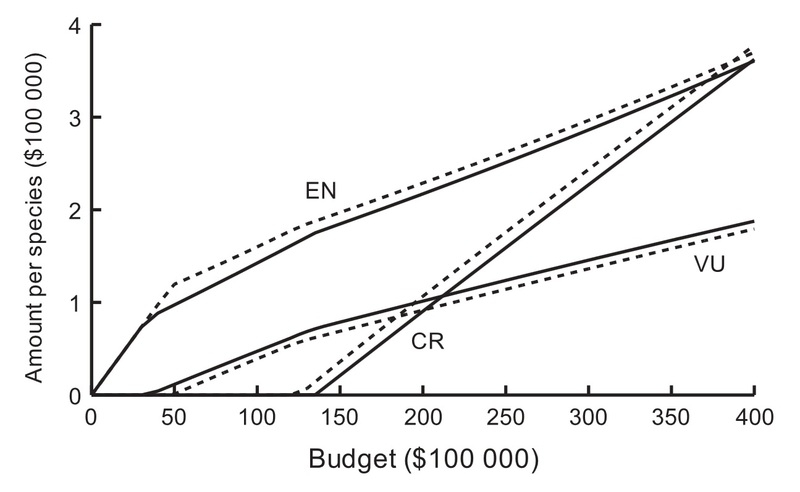 The size of the budget; the optimal allocation of resources to species depends on what we have to spend. I’ll illustrate the above four points with our analysis of Australia’s birds (McCarthy et al. 2008). 1. Using data compiled by Stephen Garnett on money spent on species and their changes in conservation status, we estimated how investment in each species changed their probabilities of decline and improvement. The findings were revealing. 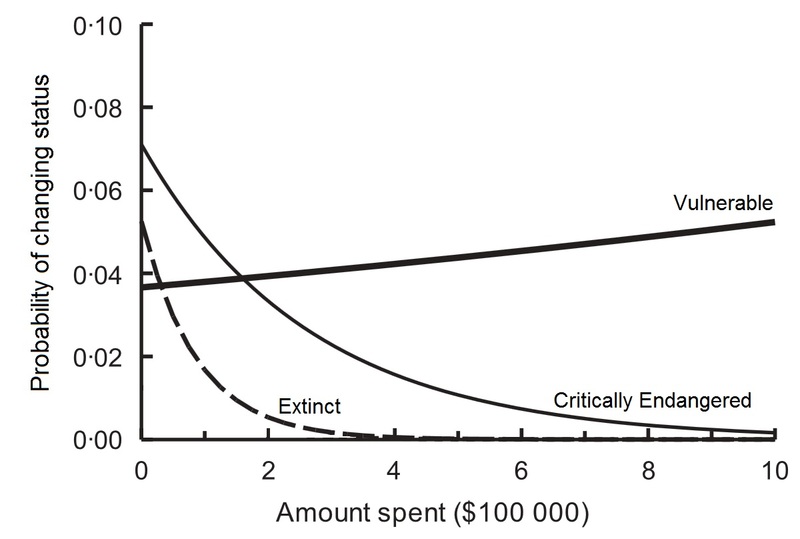 First, the probability of extinction could be reduced with relatively modest investment in each species (e.g., the dashed line in the figure below). So it is not all doom and gloom; some investment in conservation in Australia has been remarkably successful. While we could surely do better, there are at least some clear benefits of management. Example of probabilities of transition among conservation classes for a species versus total investment over an 8 year period. This shows how investment changes the probability that an endangered species becomes vulnerable (increases in abundance), becomes critically endangered (declines) or goes extinct. Approximately $50,000 per year ($400,000 over 8 years) reduces extinction risk of endangered species to near zero. Redrawn from McCarthy et al. (2008). Second, and less happily, the data indicated that the probability of improving the conservation status of a species increased very slowly (if at all) with increased investment – the thick line in the graph above. So environmental managers in Australia seem quite good at reducing extinction of birds, but we need to improve our recovery efforts or make greater efforts. 2. The analysis also showed that the choice of objective influenced where best to focus effort. If the objective is to minimize the number of extinct bird species, it is actually optimal to invest in the most endangered species. However, we should invest in species with lower extinction risks for other objectives, such as when minimizing the number of threatened species. 3. Not all species are equal. Some species are valued more by society. It seems unlikely that Australians would spend as much money preventing the extinction of a plant louse than is spent on Tasmanian devils, even if I think the plant louse is the most important species in the world. Different people might value species depending on their taxonomic distinctiveness (i.e, how much evolutionary history they represent), their role in ecosystems, their charisma, or their potential to generate tourism revenue. These are all reasons why we might mourn the loss of one species more than another. And these relative values that are placed on species will influence how effort is allocated. 4. The size of the budget influences how money should be spent. Our analysis shows that even the relative amount of money spent on each species will change with the budget. For example, when aiming to minimize the number of threatened species (weighted by the level of threat), we should invest the most money in either endangered species or critically endangered species, depending on the size of the budget. With Australia spending almost $30 million on bird conservation over an 8 year period, our analysis suggests that investing most heavily in the endangered and critically endangered species can be rational. However, changing the objective changes the optimal allocation among species. Optimal investment in critically endangered (CR), endangered (EN) and vulnerable (VU) bird species when aiming to minimize the number of threatened species (weighted by extinction risk) in 8 years (solid lines) or 40 years (dashed lines) time. Results are show versus the total budget available in each 8 year period. From McCarthy et al. (2008). So, what does this all mean? Species triage is not straight-forward. The optimal way to spend resources depends on numerous factors. One critical factor is the efficiency of management. A second factor is what level of extinction we are willing to accept. As Stephen Garnett says, “the extent to which we conserve species says a great deal about who we are as a civilised society”. Our grandchildren would be justifiably appalled if a wealthy country permitted the preventable extinction of iconic species. See also David Lindenmayer’s response to triage. But species triage is confronting. It typically highlights that with current efforts, extinctions are inevitable*. That might seem like applying cold hard economics to decide which species we aim to conserve, and those we let go. However, in fact it is warm cuddly economics, because it allows us to maximize the number of species saved with the resources available. Indeed, doing anything else but applying triage is cold and hard, because it would allow more extinctions. Triage compels us to determine what level of investment would be required to achieve acceptable levels of extinction. That allows us to make informed choices about trade-offs between conservation of species and other areas of national spending. In short, species triage is simply rational decision making (Bottrill et al. 2008). * Edit: If we don’t like that answer, we need to increase the effort, not spend resources less efficiently! This entry was posted in CEED, Communication, Ecological models and tagged bird species, conservation, ecology, endangered species, environmental decisions, extinct species, extinction, Hugh Possingham, Liana Joseph, Michael McCarthy, models, prioritization, probability, species triage, The University of Melbourne, threatened species. Bookmark the permalink. If i understand it correctly, medical triage theory is used to prioritise INITIAL response treatments to multiple casualties in various states of health. Conservation triage theory provides a decision framework to assess resource spend effectiveness and direct limited conservation funds to maximise recovery outcomes, what these outcomes are and who determines them is unclear. Importantly the state of national environmental decline is beyond first response, we are already in the emergency ward and the threats and pressures keep building. Tantamount to arriving on the scene of a train crash and commencing a triage assessment without shutting down the tracks! In many/most cases decision makers do not allocate ANY resources to reversing species declines. This is not the case in medical emergencies where there is some level of response. Who even knows about a control burn that threatens a matter of national environmental significance with extinction until it is reported post event? Multiple direct, indirect and cumulative threats, pressures and actions to biodiversity values are occurring 24/7 without awareness timely recovery efforts are beyond hope. Isn’t the question then really about how to AVOID the need to spend rather than what spending prioritisation framework should be applied because for biodiverse locations, regions, nations, no amount of spending will reverse downward trends unless the causal agents are removed. Through appropriate avoidance and minimisation controls we can reduce the need to rely on retrospective conservation management approaches and enact positive change through proaction. What are the environmental applications then? Develop frameworks that reduce human greed and consumption and mitigate the effects of unchecked human population growth and other ecologically unsustainable practices such as land clearing because it is one or the other, having cakes and eating them is a tricky business. My 2 cents. the resources required to recover the full range of species at risk should be calculated. I don’t think we should over-cook the medical triage analogy – it will break down in many places, although it can be insightful to examine where conservation triage and medical triage. However, I think people often confuse conservation triage with sacrificing the most threatened species, which is not what the literature recommends. If any species were to be sacrificed, it should be those where there is little chance of changing the risk of extinction compared to allocating those resources to other species. This is a really good analysis of the discussion and potential policy/ funding options. What are your thoughts on domesticating some of our threatened species as a way of conserving some animals, such as quolls? I’m not sure of the practicalities of quolls in particular. But your question gets to the heart of what is valued. Do people value the persistence of the species? Or is it the persistence of the role in the ecosystem that the species provides? Or a combination of both (or something else)? Clearly a pet quoll won’t have the same ecosystem roles (or behaviours) as a wild animal. Yet, perhaps there are benefits of having more native species as pets. Another question, how do we value persistence of a species in a zoo relative to persistence in the wild? Exactly. I was going to write about this in more detail on the topic. It was something I came across and hadn’t given much thought until I heard a talk given by someone (I can’t for the life of me remember who) at the Darwin Naturalist’s Club, who was advocating the domestication of bilbies and quolls as a way of preserving them, but also as having a “bank” that might be able to be called upon in future. Much better to have quolls going “feral” than more cats, for instance. The comparison is merely that – a comparison. I can’t see how it is “over the top”, or associated with any sort of wing (left or right), beyond references to birds. It simply points out that trade-offs are required in spending, and the amount required relative to Australia’s budget is not massive. Comparing metal birds with feathered ones seemed reasonable. And I’ve always like fighter jets since childhood. It looks like I’ve spelt defence with both an s and c in the post. A bet each way it seems. Thanks for pointing out the error; I’ll fix it now. And the more I think about your reference to left-wingedness, the more I think efficient allocation of available resources to maximize benefits seems, if anything, more right-wing than left-wing. Although I admit to knowing little about the meaning of each term – that’s not my area of research. Carina Wyborn’s tweet would make a better title for this post: “Spending our dollars wisely does not mean we’re giving up.” https://twitter.com/rini_rants/status/446759132951879680 That pretty much sums it up. Here’s one scenario where investing in a more threatened species is more efficient: Imagine a species with a probability of extinction (within a relevant timeframe, say 50 years) of 0.9 if we don’t act to help it. And let’s assume that if we do act, the risk of extinction is reduced to 0.5. Now consider a second species that has a risk of extinction of 0.2, but we can reduce that to zero by spending the same amount being proposed for the first species. The first species might seem like a “lost cause”, while the second might seem like a “sure bet”. However, investing in the first species is most efficient at reducing the risk of extinction, an hence the expected number of extinctions. In this example, we can reduce the extinction risk of the first species by 0.4, while in the second we’d reduce the risk by only 0.2. Thanks Mick. I guess we don’t have actual examples yet right, because so far triage has not been implemented explicitly anywhere, correct? They’ve done it in New Zealand, where they are now protecting many more species than previously (an extra 100-200 species from memory?). We are more concerned with the influence of the time horizon on the optimal investment, but a side result is that optimizing the probability that no species goes extinct (which requires concentrating money on the most threatened species) can favor completely the opposite decision than optimizing the expected number of surviving species. Actually, we show that whether decisions will differ depends also on the time horizon. A corollary of our results is that spending your money with the purpose of saving all (i.e. the most threatened species) can actually maximize the number of expected extinctions, because you’re wasting large sums on lost causes. We didn’t call it triage at that time, but I guess it pretty much makes the standard case for triage. Seems your conclusions are the same, right? Our results apply under quite general conditions, but one crucial assumption is that funds for conservation are fixed. I think many people object to triage because they feel that accepting triage implies that we accept budgets insufficient for saving all species, instead of fighting for more. Difficult to say who’s right, whether fighting for more funds instead of working with what you have is determination or hopeless romanticism. Might also depend on the country you’re working in. In our particular study on Australian birds, the time horizon was not very important – it is for a relatively technical reason about the probabilities of transition between conservation classes within a particular time period being small. You can read about that in the paper. On the question of fighting for more funds, I think triage makes the case for that fight stronger, yet it is falsely portrayed as “giving up”. Because triage forces us to calculate the likely number of extinctions with current levels of investment. We either need to make the hard choices with the current level of funding, or increase the investment. But even if we increase the investment, we should spend those resources as efficiently as possible (i.e., we should still implement the ideas of triage). Personally, I think triage is the best we can do at the moment to preserve our natural heritage for the next generation. However, I can understand why people would oppose triage for moral reasons, in particular if they have strong moral values / rights attached to the concept of a species. I seems to me that also for humans, we accept triage only in emergency situations, in which time is really scarce resources could not be increased. Somehow it seems less ethical to apply triage to “choose” human survivors in non-emergencies, when there is time to think and resources could be increased with relative ease. For example, I don’t think we optimize survival only while distributing public health funds. Funding decisions also reflect the right of individuals to receive treatment if they are ill, even in “hopeless” cases. If a person attaches equal rights to a species than to a human individual, I can see how he/she might oppose triage. Just to repeat myself, I’m not against triage, but I do think that it’s tricky terrain morally speaking. 2) disagreeing about the particular aim of conservation (e.g., the relative values that might be placed on species if they are weighted differently). This later concern – disagreement about the aim of conservation – is clarified by using triage; it exists regardless of whether efficient allocation is used or not. So the concern is not arising from the use of triage – triage simply makes it more apparent. b) arguing against the moral logic of consequentialism – many important arguments in the course of western philosophy can be found here http://en.wikipedia.org/wiki/Consequentialism, but to highlight one, I might just say I find it unethical to not help the weakest member of the group, regardless of the consequences.